This journey is for those who wish to explore all Laos. Though it is quite relaxing but participants should have a heart for adventure. From Chiang Rai, a transfer to Chiang Khong and Crossing the border to Laos. Upon arrival at the Chiang Rai airport, transfer with private vehicle (2 hrs) to Chiang Khong. This Thai border town with Laos is nestled on the banks of the Mekong river. Then we cross the Mekong River to Laos. Overnight at Arimid GH. Following an early breakfast at the hotel we meet up with our local guide before continuing our trip to Laos. In Ban Houai Xai we will board our boat and cruise down the Mekong River to Pakbeng. Stops are made en route to observe village life along the river and discover dwellings of ethnic minority groups. After early rise we’ll visit the local market where tribes exchange their wares. Afterwards we start the second leg of the cruise. Before arrival in Luang Prabang we’ll stop at a Hmong village and visit the Pac Ou caves filled with thousand statues of Buddha. En route you’ll get the opportunity to taste the national liquer ‘lao lao,’ and observe the tradional processes of making local rice whisky. Luang Prabang, the former royal capital, is best known for its ancient temples and romantic setting at the confluence of the Mekong and Kane Rivers. Because of the compact size of the peninsula, Luang Prabang is best explored on foot. In the morning we embark on a half-day walking tour, visiting the National Museum (formerly known as the Royal Palace), wat Xieng Thong, wat Sen and wat May. The afternoon is free to explore or relax on your own. Perhaps you’d like to climb the Phousi Hill to enjoy excellent views of the lush green World Hertitage city and the Kane and Mekong River. This early morning you may want to wake up early and participate in a daily Lao morning ritual. 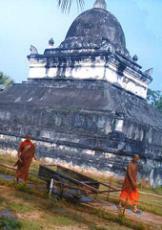 Monks carrying their bowls, wander trough town blessing local people who give them offers (mostly sticky rice). After breakfast a day trip to the beautiful Kuang Si waterfalls where turquoise waters cascade over limestone formations. The abundance of water forms a magnificent display of nature. Below the Kuang Si are large ponds perfect for swimming and cooling off under the spray. Before enjoying a picnic lunch next to the pools, we will pass stupendous landscapes, teak forests and several ethnic minority villages (Hmong and Khmu). In Ban Phanom, a weaving village, we can find excellent pieces of Lao textile. Near the waterfalls it’s worth while to visit a centre where the endangered black Asiatic beers found a safe shelter. By road we depart this morning to Xieng Khouang, home to the amazing Plain of Jars. Travelling trough high mountains and karst formations, we have time to stop and visit remote dwellings of ethnic minority villages. Probably you will notice that many houses have looms underneath with which the family’s clothes, bags and accessories are manufactured. Late afternoon we’ll arrive at Phonsavan, the capital of the Xieng Khoung province. By bus and a short trek, we’ll spend the day exploring the Plain of Jars (number 2 and 3) and the surrounding area. The jars are thought to be 2000 years old, although there is little proof to date them very accurately. Archaeologist still struggle to find out the specific purpose of the jars, were they used for funerary urns or to store rice wine. En route to Vang Vieng we’ll have time to stop to take in the scenery from the viewpoints. Vang Vieng is a small village settled between a spectacular spread of limestone karst and is surrounded by lush green paddy fields and dwellings of ethnic minorities. The terrace of your hotel offers plendid sunsets amidst these magnificent natural settings. Today is free to relax or explore Vang Vieng, a place famous for it’s limestone cliffs. You can visit the caves or cycle in the nearby countryside. Other alternatives include ‘tubing’ down the Nam Song River. Vang Vieng is also the perfect place to unwind. An approximately three hour drive will take us to the capital of Laos. Vientiane is a friendly sleepy town resting on the shores of the mighty Mekong river. In the afternoon we include a sightseeing tour around the city. We’ll explore some of the best sights including the Victory Gate (Arc de Triomphe), the wat Sisaket, and the impressive That Luang Stupa, the country’s most important monument. Also visit the ‘morning market’ where you can wander around and buy silver, silk or other items you like to take back home. In the evening you can stroll along the banks of the Mekong River. Early morning we fly to Pakse. Upon arrival we drive and travel on a wonderful local ferry over the Mekong River to Champasak. Here we visit the sacred Khmer temple of Wat Phu. This complex represents the most eastern border of the Khmer Empire in the 4th centurary. Later in the afternoon we take a scenic drive and boatride to Don Khong. This island is one of the larger permanently inhabited islands in the ‘si pan don’ area. Dong Khong is best explored by bicycle. A reasonsable dirt road circumvents the island. By boat we’ll explore the 4000 islands area (si pan don). Here, the Mekong River is at its widest. During the rainy season it is up to 12 km across. When the waters recede, many small islands emerge. It is from this phenomenon that the region takes its name. From far distance you can hear the unmistakeable roar of the Khone Phapheng and Li Phi falls, which we will visit today. Nearby the falls live some hundred Irrawaddy freshwater dolphins. Ban Hang Khon is one of the rare places on earth to spot these endagered mammals. Also see the old locomotive, railway and colonial bridge built by the French to avoid navigating on the rapids and waterfalls that abound on this section of the Mekong. Overnight at Khong Island. By boat and bus we leave early morning to drive to Pakse. Our activities today include an elephant ride and visits to villages on the Phou Asa. We overnight at our hotel Champassak Palace. After breakfast, drive back to Lao/Thai border at Chong Mek. From the Thai city Ubon we fly back to Bangkok. Or we flight from Pakse to Siem Reap.